WASHINGTON (Sept. 16, 2008) -- Two Army libraries took half of the federal library awards for 2007 -- including both the large library of the year and the small library of the year awards. The large library award went to the Combined Arms Research Library at Fort Leavenworth, Kan. The small library of the year award to the Landstuhl Regional Medical Center Library, in Landstuhl, Germany. Lt. Gen. Michael D. Rochelle, deputy chief of staff G-1, met Sept. 12 with Conny Camerer, Landstuhl Regional Medical Center Library librarian, and Edwin Burgess, Combined Arms Research Library director. Camerer and Burgess were recognized by the Army G-1 as representatives of their individuals libraries, both recently named as best libraries within the federal library system. Representatives of those libraries, including Edwin Burgess, CARL director and Conny Camerer, LRMC librarian, attended an awards ceremony Sept. 12 at the Library of Congress. The two later visited the Pentagon, where their organizations were again recognized for excellence by Lt. Gen. Michael D. Rochelle, deputy chief of staff, G-1. 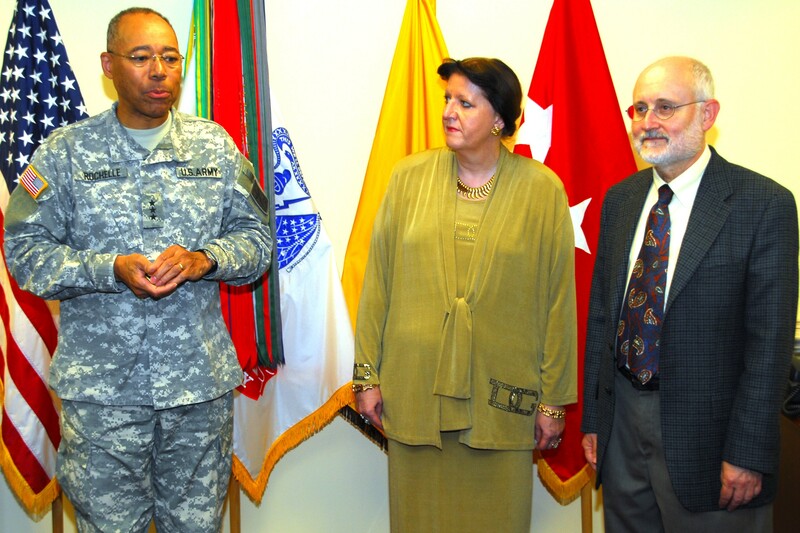 "I am a huge fan of the value that librarians bring to the table," the general said. "I have tremendous respect for the research ability, the spirit of support and cooperation and the science in general. This is no small event that we are witnessing here for both Landstuhl and for the Combined Arms Center." The library at Fort Leavenworth, which supports the U.S. Army Command and General Staff College there, houses some 400,000 books, about 200,000 documents, and supports some 8,000 students, faculty, scholars and staff. It was recognized in part for its use of technology. Evidence the library is satisfying its customer base is demonstrated by a 28-percent increase in use of its database and a 76-percent increase to searches in its online public access catalog. The Landstuhl Regional Medical Center Library has been recognized for its unique world-class research facility, specializing in medical and dental medicine and serving numerous additional military medical facilities in Europe, Africa and the Middle East. The library serves some 3,000 medical professionals and has improved service to them by providing customers with exceptionally fast turnaround on locating hard-to-find research material. "Fast document delivery is the key to success in my library," Camerer said. "Mostly people request articles, and we work diligently to provide full text documentation. While we are 6,000 miles away from the continental United States, sometimes it takes only a half hour to get a document. We're like a portal -- an information gateway." Burgess said that providing information to those not actually in the library is also becoming important. More and more, he said, information requests are coming from the outside. "The networking and the transfer of information is more important," he said. "Speed of that is important too. In the past, libraries mainly served people in their walls. That is now becoming less and less true. Today, we still serve people within our walls, but it is quite routine to get requests for information from the theater." Despite the growth of the Internet and information resources like Wikipedia, Burgess said he doesn't think brick and mortar libraries are going anywhere, and will remain important -- especially to researchers such as the ones both his and Camerer's libraries serve. "One thing a library can do is give you filtered information," he said. "We can ensure it comes from a good source. If you go to Wikipedia for example, you have a perfectly good article by some guy -- that may or may not know squat. If you go to Conny's library and ask what a squamous cell melanoma is, you will not get an answer from some guy." "What you'll get is a peer-reviewed article -- solid information," Camerer said. Burgess has been an Army librarian for nearly four decades now, Camerer has been doing the same for some 15 years. She said representing the LMRC and having her library named the best small library in the federal government has been a real highlight for her. "This is probably the highest recognition I've received in my life," she said. "And to be recognized by the G-1 of the Army is tremendous."